Thirty kinds of fish and thirty different streams." In an anonymous manuscript in Bromley House Library and dated 1641 there is a list of these thirty different fish which I give for what they are worth, some of them seem to be extraordinary. 1. Sturgeon. 2. Shad. 3. Salmon. 4. Carp. 5. Trout. 6. Pickeral. 7. Grayling. 8. Barbet. 9. Chevin. 10. Bream. 11. Perch. 12. Flounder. 13. Ruff. 14. Lamphrey. 16. Lampern. 16. Eel. 17. Smelt. 18. Gudgeon. 19. Dates. 20. Roach. 21. Lenbrood. 22. Loach. 23. Crayfish. 24. Whitling. 25. Frenches. 26. Burbolts. 27. Bullhead. 28. Minnows. Of these, fifteen are proper to the province of Trent; Sturgeon, Salmon and Smelt, are accidental from the sea. Carp, Trout and Trench are thrown by flood from ponds and smaller streams. There were swimming baths in the Trent as early as 1750, and by 1773 two baths had been erected, one on either side of the bridge, one of which was reserved for the use of ladies. These were improved in 1857, and in 1895 the modern Trent Baths were erected. There was a ford just a little to the west of Trent Bridge about forty years ago, but I believe that it has been completely dredged away. Whether it was a primeval ford or not we have no means of knowing. There was an old horse bridge across the Trent just about where the Grantham canal enters it, but this was washed away by a flood in 1875 and its debris was removed. The town wharfs, which were of course of very great importance, were situated round about the northern end of Trent Bridge. In mediaeval times when roads were very bad indeed and traffic upon them both slow, costly and difficult, water traffic was of much more importance than it is nowadays, and the traffic from these wharfs would proceed in the small boats of those times down the Trent, sometimes transhipping their cargoes at Gainsborough, situated at the head of the tidal waters of the Trent, and sometimes conveying their burdens overseas. In connection with Trent traffic it is interesting to remember that the first steamer on the Trent commenced to ply in 1825. It belonged to Mr. John Bradshaw, who was a well-known carrier and wagon proprietor of those times, and it carried cargo and passengers as far as Gainsborough from which place the passenger would take coach to Hull or to Scarborough, or any northern destination. Why is the name "Trent Bridge" and not "Nottingham Bridge"? We have "Burton Bridge," "Newark Bridge," "Muskham Bridge," and so forth, but the Bridge at Nottingham does not bear the name of its adjacent town. The reason is that when Trent Bridge first came into being, Nottingham was a long way from it, a mile or more across the open country. Early passengers would cross the Trent by the ford that we have just mentioned, or possibly would ferry themselves across in primitive canoes, but when Edward the Elder, the son of Alfred the Great captured Nottingham in 924 he built a bridge across the Trent somewhere in this neighbourhood, and he defended it by a fortress of some description at its southern end. This bridge would probably be largely made of wood, its piers perhaps would be stone, but certainly the platform and probably the superstructure would be wooden and unfortunately we have no evidence as to its exact position. Whatever was its appearance it was the most important bridge that had been built in Britain since the Romans left the province and, like London Bridge, over the Thames, it was the last crossing of a great river before it joined the sea. This bridge remained in use until it was replaced by Henry II. sometime about the year 1156. Henry's bridge was indeed of importance. It was called the Heth Beth Bridge, which probably means the bridge by the "hythe" or "wharf" near the "beth," "wath," or "ford" and it bore upon one of its many arches a chapel dedicated to St. Mary which was endowed to support two chaplains and in which marriages might be solemnised. These chapels upon bridges were quite common during the middle ages, in fact bridges as well as roads were intimately associated with religious matters the repair and upkeep of both roads and bridges being regarded as a sacred duty. We have a record of a grant being made to this chapel early in the 14th century, by John Le Paumer and Alice his wife of the sum of £6 13s. 5d. to a chaplain to celebrate Masses for their souls "in the Chapel of St. Mary upon Heth Beth Bridge." A fragment of the tracery of one of the windows of this chapel was discovered in the bed of the Trent in 1826 and is now preserved in the apartment of the Thoroton Society. By 1364 this bridge of Henry II. 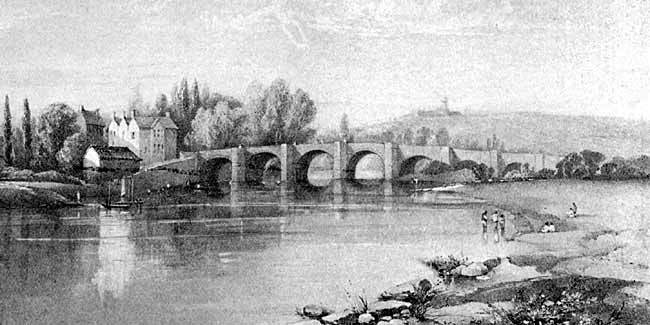 's time had become very dilapidated and extensive repairs, amounting to almost a re-building were necessary, although in 1209 the brethren of St. John the Baptist, in Nottingham, had attempted to do something for the upkeep of the bridge. Up to this time the bridge had been maintained by the counties of Nottinghamshire, Derbyshire and Lincoln, but about now the town of Nottingham undertook the complete repair of its twenty arches and two years later appointed two bridge-masters to undertake the responsibility. Gifts and bequests towards its upkeep were received and lands and hereditaments were purchased to provide an income for its repair. This formed the foundation of the Bridge Estate, the first lease under which was granted in 1541. In 1551 Edward VI. granted the property of the hospital of St. John of Jerusalem in Nottingham, together with the Chantry upon Trent Bridge to the Bridge-Masters or their representatives for the upkeep of the bridge which of course considerably augmented the bridge's income. But in spite of this the bridge fell into decay and indeed in 1636 became so ruinous that one arch fell down completely.